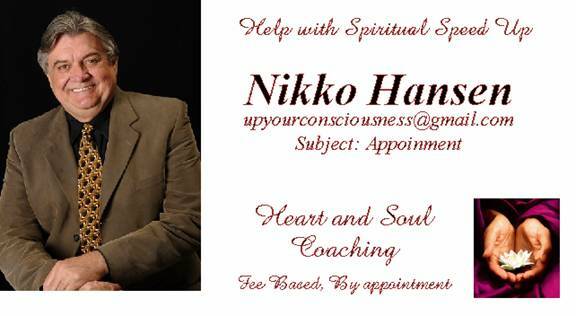 Nikko traveled with Dr. David Hawkins (Power Vs Force) for about four years. During that time, around 2003, Nightingale Conant produced this CD set Many people have commented on Nikko’s portions of this CD. You may enjoy it too. This is an offer site direct to Nightingale Conant. Nikko receives no Compensation of any sort for any sales. But, it's a great deal..
“What I especially appreciate about these CD's is the interplay between Dr. Hawkins speaking about the Truth and Nikko explaining how that Truth has impacted his own life. As an added bonus, there is a CD of Nikko chanting. March of 2005 Nikko was invited by Alex Hermosillo to appear on his Radio show on Achieve Radio to discuss the Bluedomers. Arrangement – Bill Kimes , Arizona Prostudiios. An accomplished songwriter, Nikko penned this beautiful and telling song around the time he first began pondering the Bluedomers. The bells at the beginning are authentic Tibetan bells. Nikko has hosted the Tibetan monks from the Gaden Shartse monastery three or four wonderful times at his home. Bill's addition of these bells at the beginning of this beautiful song is a clean, clear and fitting intro. The same wonderful voice that resonates in his chanting is captured here. The David Gibbons In Discussion Show. March of 2010, Nikko participated on a panel discussion on VoiceAmerica™ Talk Radio. This is thought provoking and topical with political thoughts dusted in. A Philosophical Perspective of the Social & Economic Status of our World Today." During this program Leo Hirshocker, Nikko Hansen and Randall Libero join David Gibbons sharing their wandering global views and stories in at times, a humorous and polarized somber fashion. From world politics to spiritual opinions the program talks to new world paradigms, challenges and opportunities.